How often do we have the opportunity to chat with an author who has written 18 novels? Not very often! Lisa Wingate is a multi-published author who writes inspirational women’s fiction and romance. What does that mean? It means a lot of things to Lisa, but what struck me most is how Lisa wants her readers to be better off for reading her book. Whoa. And yes. Also below you will find some of the most generous aspiring author (and any author) writing advice that we’ve had here on WFW. Lisa is a true gem for taking the time, and having the heart, to share so much with us today. Please welcome Lisa Wingate to Women’s Fiction Writers. Amy: On your website it says “Fiction That’s Good For the Soul.” What does that mean to you, and what do you want it to convey to anyone visiting your website? Lisa: My first mainstream novel, Tending Roses, was published in 2001 in the general market by Penguin Putnam. At the time, there was a strong division between general market books and Christian books. Tending Roses was one of the first novels to fall in that middle ground. Selling the book took a little over a year — roughly four months of searching for the right agent, and then about seven or eight months of shopping the book around to publishers. Because it fell somewhere between Christian and mainstream publishing, which were very separate back in the day, that was an interesting process, involving many rewrites and much discussion with several publishers. Eventually, we ended up selling the book to Penguin. I’ve always wanted to write stories that leave my readers better off than they were at the beginning, books that were uplifting. My characters start out living a life that wasn’t totally genuine for them, question that, and learn some life lessons along the way. At this point, I’ve been blessed to write twenty novels (18 published and two on the way) for both general market and Christian publishers. I love having books shelved in places where people who have never tried a faith-based novel might give one a try. Eventually, I “branded” my works as “Fiction that’s Good for the Soul” and I love hearing from readers who tell me what the books have meant to them. My website is designed to welcome new readers and longtime, faithful readers. I like it to be a place for us to connect. Visitors can learn about my books, check for contests, sign up for my e-newsletter, request for me to speak at an event, find writing hints, see what I have bragging rights to (awards, etc. ), and check my appearances page to see if we might meet in person at some event. I realize that the tide has turned some toward Facebook, Pinterest, Tweeting, and blogging, all of which I love to the point of addiction. But, my techie and I try to make sure the website gives all the basic information and a way to contact me FMI. 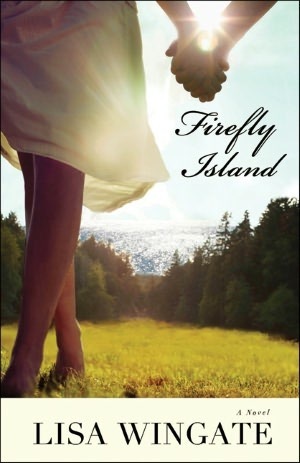 Amy: Can you tell us a little about Firefly Island, your eighteenth novel (Wow! Congratulations!) without any spoilers of course? Lisa: At thirty-four, congressional staffer Mallory Hale is about to embark on an adventure completely off the map. After a whirlwind romance, she is hopelessly in love with two men–fortunately, they’re related. Daniel Everson and his little boy, Nick, are a package deal, and Mallory suddenly can’t imagine her future without them. Firefly Island is part real life and part whimsey. Years ago, my life took a similar turn when, through a series of family connections, my husband was offered the chance to leave his corporate job and operate a ten thousand acre ranch in the Texas Hill Country. Like Daniel in the story, he really did walk out of the bedroom (looking quite peaked and somewhat terrified) and say, “I… ummm… think I’ve just been offered a… ummm… job in… Texas.” It was fun now that I’m nearly at the empty nest stage to look back and put some of our early marriage/ young family experiences in this story. Amy: Your trademark, your “brand” to use today’s buzzword, is that you write inspirational women’s fiction and romance. Why is it important for you to weave these elements into your stories? Lisa: I write women’s fiction, because I think it’s the most natural thing to write from where you live. I am a wife, and a mom, and a community member, and a friend. The things I experience, and wrestle with, and find joy in, in life, come mostly from these areas. As far as the romance, what woman doesn’t want romance in her life and in her stories? Everything from love-at-first-sight in Firefly Island, to the rekindling of an older marriage, as in The Summer Kitchen and Never Say Never come into my head and out my pen… well, actually off my computer keys. Amy: Can you tell us a little about how you get the ideas for your novels? Do they just pop into your head fully formed? Do you sit and mine your thoughts for a good story? And then, do you just start writing or do you outline, make character worksheets, or notes? Lisa: I come from a long line of Irish storytellers and married into a big Texas clan of storytellers . Rich family legends and tales abound at our holiday dinner tables and are so numerous that some aunts, uncles, and grandparents have recognized themselves in my novels. And, stories come from waiting in line at Wal-Mart and watching the impatience of the lady in front of me huffing and fuming as the checkout person chats a moment with an elderly man who has lost his prescription service card. What I could do to that fussy, rushed, impatient woman in my story! Stories come from a sweet lady in my booksigning line who said, “There is a story right here in Waco you should know about. Shall I tell you?” My eyes lit up as I thought I’m always looking for a good story. Right then I learned about the Gospel Café, The Summer Kitchen was born, and went forth to inspire other towns to have a similar “restaurant” that serves meals several times a week to anyone who comes. Stories come from a male reader fan who wrote me saying nice things about Texas Cooking (a very pink book, by the way) and offering to help with Internet projects. Over time he went on to share about his long and rich space career and his views on being so often gone during his daughter’s upbringing. Those reflections ended up as J.Norm in Dandelion Summer. And, stories come from… Well, it’s enough to say that stories live everywhere around me in the people I meet, and in my mind. The tough part is those rare days when the computer screen is a blank slate, I open my notebook, and I’m supposed to write that synopsis and first couple of chapters for my editor. Which story? It will be the one I’m most excited about at that point and that has ‘gelled’ in my mind. I may need to find a consultant or do some research for details, but I’ll start meeting my characters on those first pages and the story will move along—not always as I first envisioned it, but I can depend on my characters to learn and grow and end in a better place and that makes me happy. Amy: Women’s fiction comes in all shapes and sizes. What’s your definition of women’s fiction? Lisa: For me, women’s fiction is anything that deals with every day lives, and struggles, and hopes, and dreams of women. Which is not to say that our stories aren’t fine for men to read too. Some of my sweetest reader letters actually come from men, but I think as women we are natural communicators. We seek to work out our struggles in life by sharing them and by walking through others’ experiences alongside them. In these my modern times, when we don’t get together anymore as our grandmothers did to do our washing and mending and chatting at the back fence as we go through our daily chores, book clubs and sharing the lives of women through story have become a critical element in fulfilling that need for support and sisterhood. Amy: What is your best advice for aspiring authors of women’s fiction? Lisa: First, remember that everyone starts out as a yet-to-be-published author. I know it sounds elementary, but don’t attempt to set out into the publishing world until you’re fully ready. In other words, begin by finishing a novel. It’s almost impossible to sell a partial manuscript or idea if you’re unpublished. Polish it and send it out, because as much as we’d like them to, editors won’t come looking in your desk drawer. Yes, showing your work to the world involves some risk. Don’t take a critique too seriously if you hear it from one person. Editors, agents, friends, and readers are individuals. What works for one may not work for another. If you receive the same comment from multiple sources, consider revising your manuscript before you send it elsewhere. Be tenacious, be as thick-skinned as possible, keep writing while you wait for news. If the first book sells, you’ll be set for a two-book deal. If the first one doesn’t sell, you have eggs in another basket. If there is a particular area of your writing that seems to be holding you back (action scenes, dialog, description, characterization, etc.) devote extensive study to this area. Seek out conference sessions and online workshops devoted to the topic. Study other authors’ techniques in this area. Don’t just read and admire—dissect, break down, make notes, keep a scrapbook of examples and notes-to-self. Read these notes-to-self when you’re stuck/struggling/editing something that isn’t working. Watch for overbalance of narrative in your writing. Nothing slows down the pace of a story like huge patches of narrative. Narrative produces pages with big, blocky paragraphs that read slowly, and that tend to “tell” rather than “show”. When possible, work story elements into dialog, action, reaction, and short thought sequences, rather than using narrative. For example, rather than describing the main street of your town, have your character walk down Main, greet a neighbor or two, and reflect on a few random childhood memories of people/places. Be careful that you don’t slide down the slippery slope of having characters engage in meaningless chatter designed only to dump information to the reader, but always seek opportunities to work details in naturally during character interactions. Remember that body language speaks volumes, too. Lastly, never marry yourself to one project. Keep creating new material—that’s where the joy is, and if you keep the joy in this business, you keep the magic of it. And develop a sisterhood around your writing passion. I mean ‘sisterhood’ as a general term—guys can be great supporters also. Be in a book club so you can listen to what others love about the books they read, be in a writers critique group so you can learn from the struggles of others and get help with your stumbling blocks, offer to be an influencer for a few authors who write in your genre, subscribe to some women’s fiction writers’ newsletters and read their blogs, go to conferences and start making agent and editor appointments when you are at that point, start a beta reading team of several discerning readers who will be honest and help you perfect that first novel for submission. If you have a God-given desire to write and a story to tell, then don’t let anything hold you back. Lisa Wingate is an award-winning journalist, magazine columnist, popular inspirational speaker and a national bestselling author of 16 books. Her first mainstream novel, Tending Roses, is in its fifteenth printing from Penguin Putnam. Tending Roses is a staple on the shelves of national bookstore chains as well as in many independent bookstores. Recently, Lisa’s Blue Sky Hill Series, set in Dallas, received national attention with back-to-back nominations for American Christian Fiction Writers Book of the Year Award for A Month of Summer (2009) and The Summer Kitchen(2010). In 2011, Lisa’s Novel, Never Say Never, won the American Christian Fiction Writers Book of the Year Award. Pithy, emotional, and inspirational, her stories bring to life characters so real that readers often write to ask what is happening to them after the book ends. Lisa is one of a select group of authors to find success in both the Christian and mainstream markets, writing for both Bethany House, a Christian publisher, and NAL Penguin Putnam, in mainstream fiction. Her bestselling books have become a hallmark of inspirational southern fiction. Her works have been featured by the National Reader’s Club of America, AOL Book Picks, Doubleday Book Club, the Literary Guild, American Profiles and have been chosen for numerous awards. When not busy dreaming up stories, Lisa spends time on the road as a motivational speaker. Via internet, she shares with readers as far away as India, where her book, Tending Roses, has been used to promote women’s literacy, and as close to home as Tulsa, Oklahoma, where the county library system has used Tending Roses to help volunteer mentors teach adults to read. Recently, the group Americans for More Civility, a kindness watchdog organization, selected Lisa along with Bill Ford, Camille Cosby, and six others, as recipients of the National Civies Award, which celebrates public figures who work to promote greater kindness and civility in American life. « Winner Announced For Custom Bracelet By Author Julie Kibler! Congratulations on 18+ novels, Lisa. You are an inspiration! Thanks for confirming one of my long held beliefs that there is a middle ground between Christian and mainstream fiction. Your books comfirm it and I find my own writing navigating the same path. It matters that we work with what is important to us and allows us to tell our stories. I think there’s more middle ground all the time. The two arenas were very divided when I started into women’s fiction in 1999, but I think these days, companies on both sides have recognized the value of something that brings those two markets together. And yes, I think the best stories we tell are the ones that matter to us on a soul-deep level. Excellent advice, Lisa, especially about building up a sisterhood around you as you explore your writing path. Thank you. Congratulations on all of your success! Thank you for the good wishes, Karen! I really don’t know what I’d do without the “sisterhood” that has walked this path with me. Those writer-supporters are special saints!